Manufacturers in East Yorkshire fear a Budget drive to close VAT loopholes on static caravans may "damage" sales and lead to job losses. From 1 October 2012, the 20% sales tax will be levied on static caravans which are currently VAT-free. According to the National Caravan Council (NCC), about 95% of all British caravans are made in East Yorkshire. 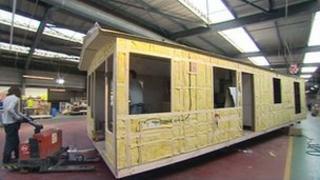 Labour MP Diana Johnson said imposing the VAT would be a "blow" to the local caravan industry. She said: "This will have a real impact on the economy in Hull because we manufacture a great deal of the caravans in this country. "I understand it could almost reduce demand by 30%, another hammer blow." The caravan industry suffered more than 1,500 job losses in 2008, blaming the economic downturn. Mel Copper, chief executive of ABI Ltd, said: "My first concern is for the people who work for us, we're 25% of the market with 350 employees and the government's own statistics have stated that they're expecting the market to reduce by 30%. "So if you look at us as a manufacturer, and our competitors and their supply chain, that's roughly 1,200 jobs, maybe more, that's going to disappear in an area that's slowly picking up from the recession of 2008/9." John Lally, director general of the NCC, said: "A sudden 20% hike in price will significantly damage sales of caravan holiday homes. "The market is already facing difficult trading conditions. The proposal from government will likely lead to significant job losses in the manufacturing sector and induce business failures." The loophole on static caravans has remained unchanged since the introduction of VAT in 1973. The Treasury said it wanted to address "borderline anomalies" and close loopholes in the VAT system "to prevent avoidance and ensure compliance". A levy on static holiday caravans will bring it in line with mobile caravans. Peter Nevitt, managing director of Victory Leisure Homes, said: "The last thing we want is retail prices going up in the current economic climate. It's bad news for the industry and it's bad news for Hull. "The industry is already hurting."